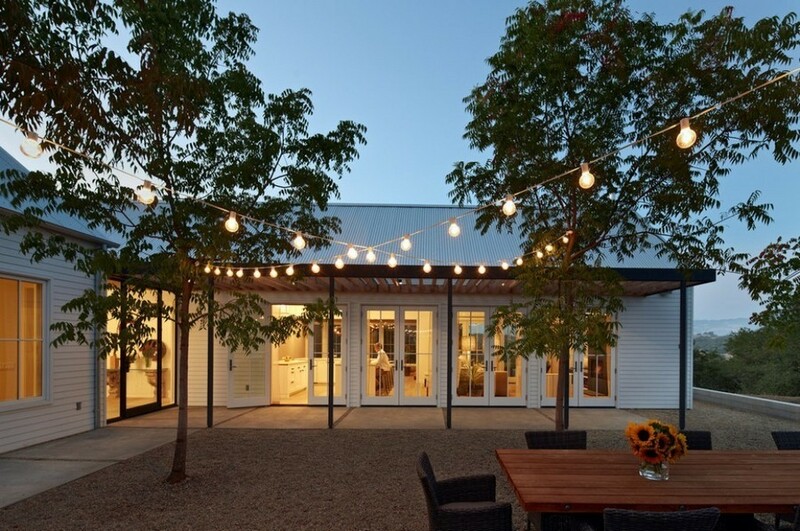 The season of pleasant journeys to the countryside, happy strolls along the gardens and little family get-togethers in gazebos is about to begin. 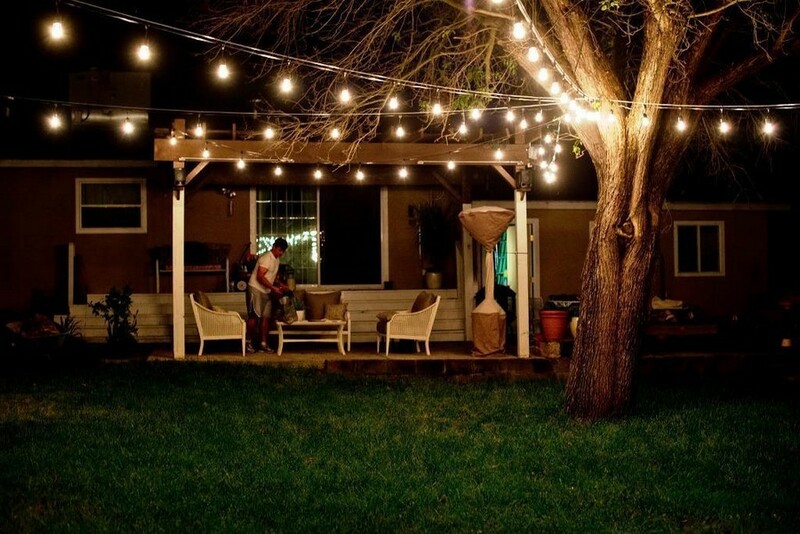 And we were wondering how to make these happy moments even more powerful and cozier with the help of the right lighting. 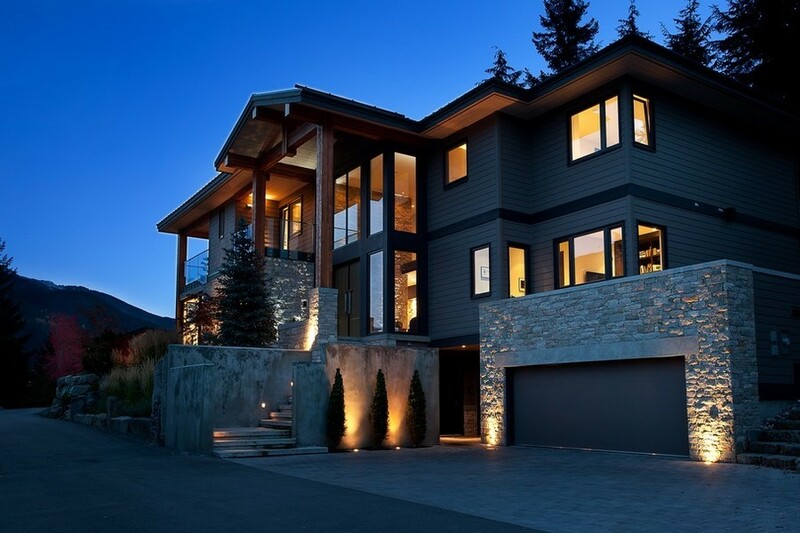 Let’s find this out together! 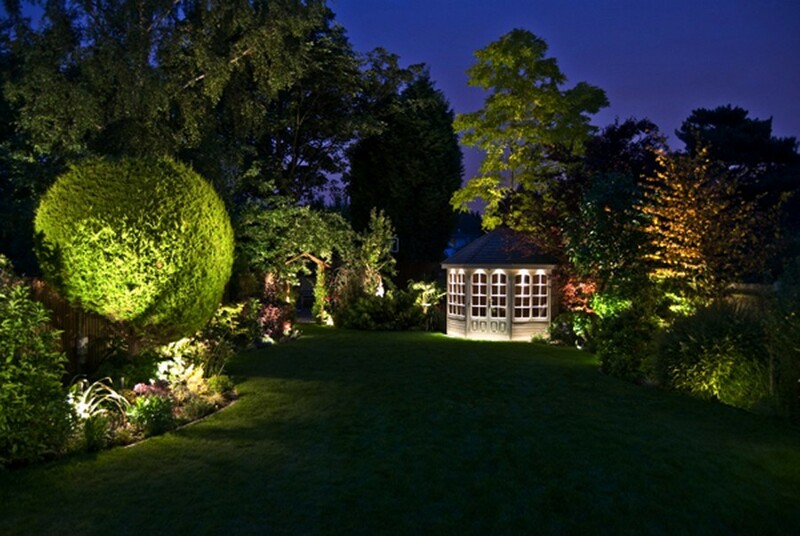 It’s a pleasure to be out in the garden in the daytime: flowers, lush greenery, garden sculptures and a beautiful hedge do their part. 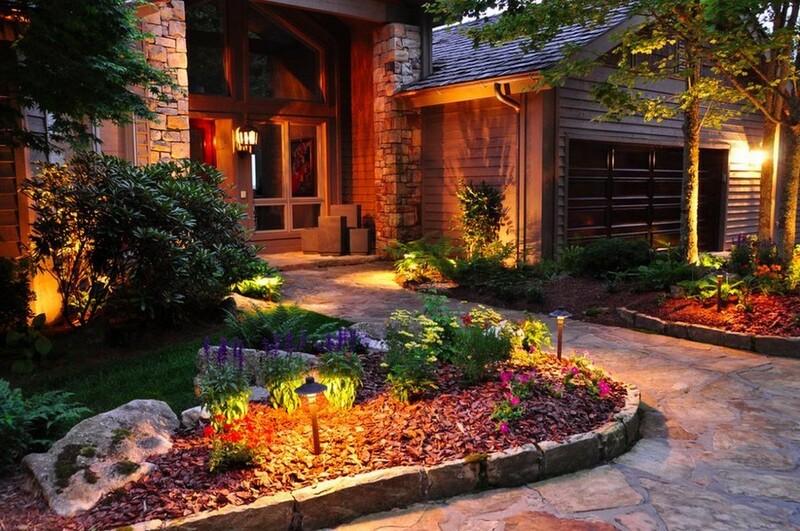 But when the sun sets, one can’t do without well-thought-out lighting. 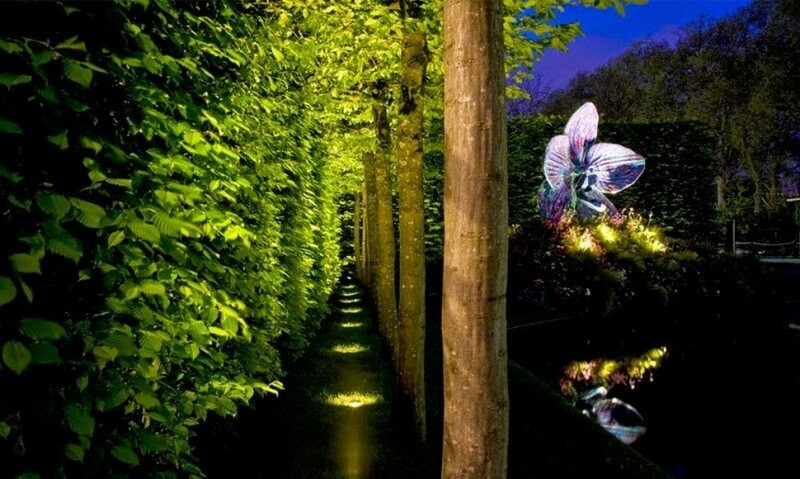 Because a branchy tree will seem like a monster from a nightmare, a walkway will be found to the touch and finally there’s a chance to fall into one’s own pond. 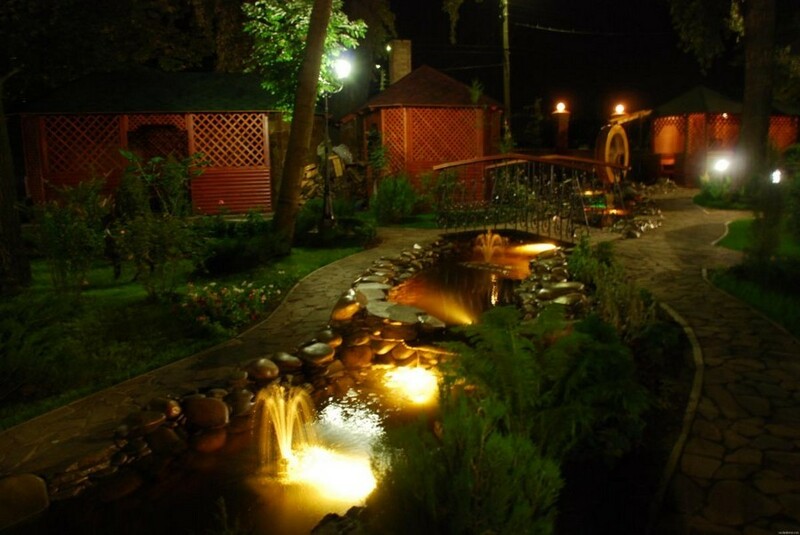 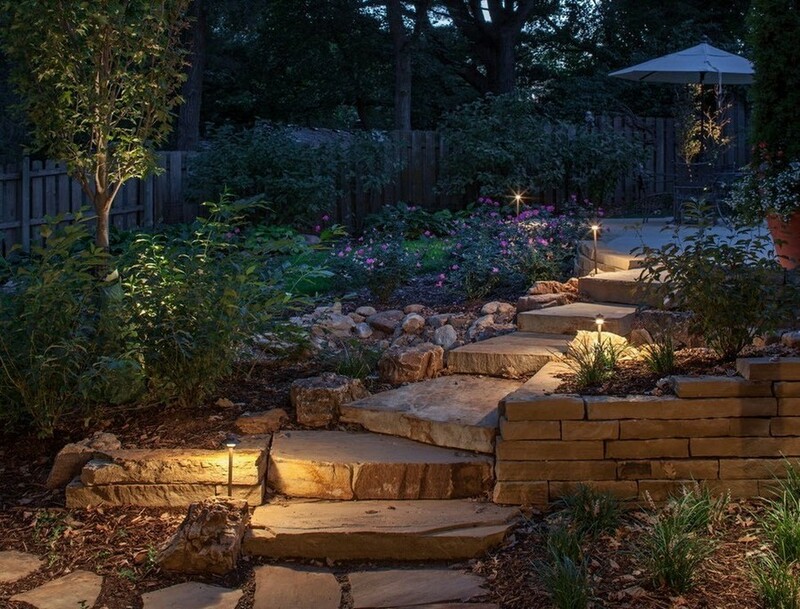 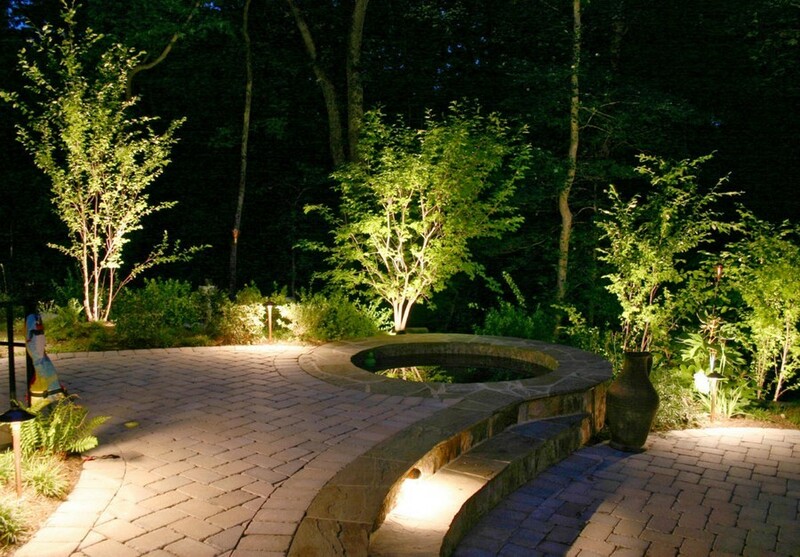 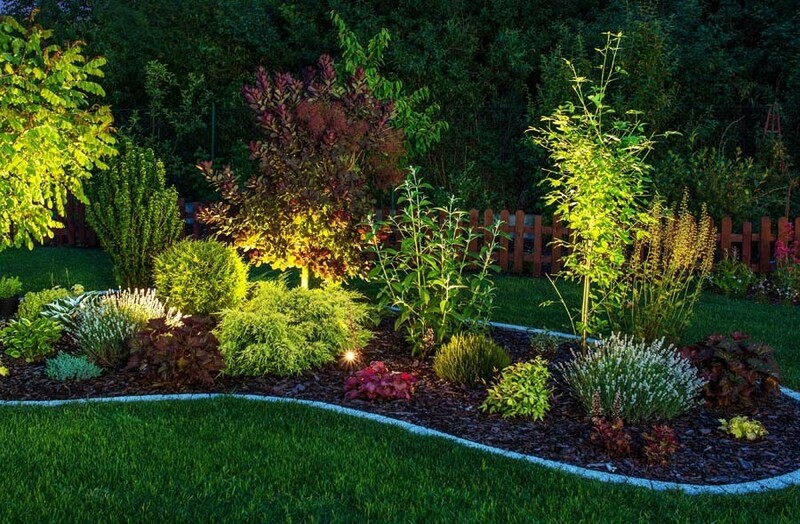 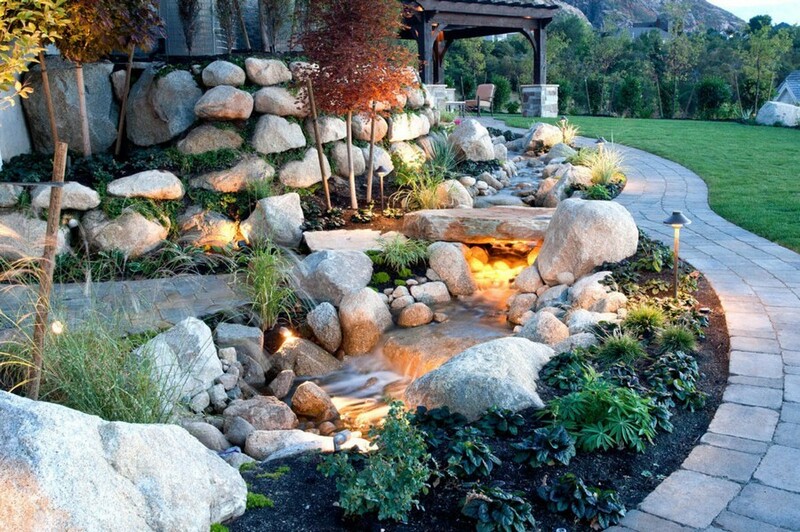 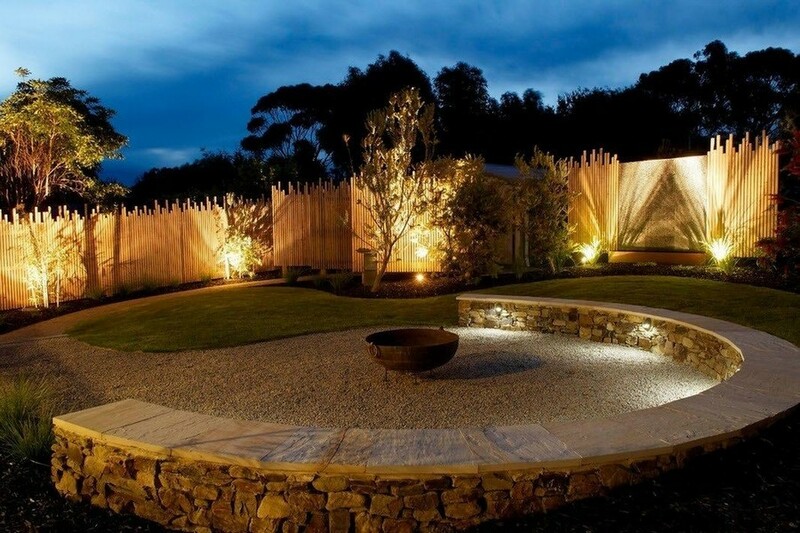 When it comes to illumination of flower beds and low shrubs, you can do with just a few well lights. 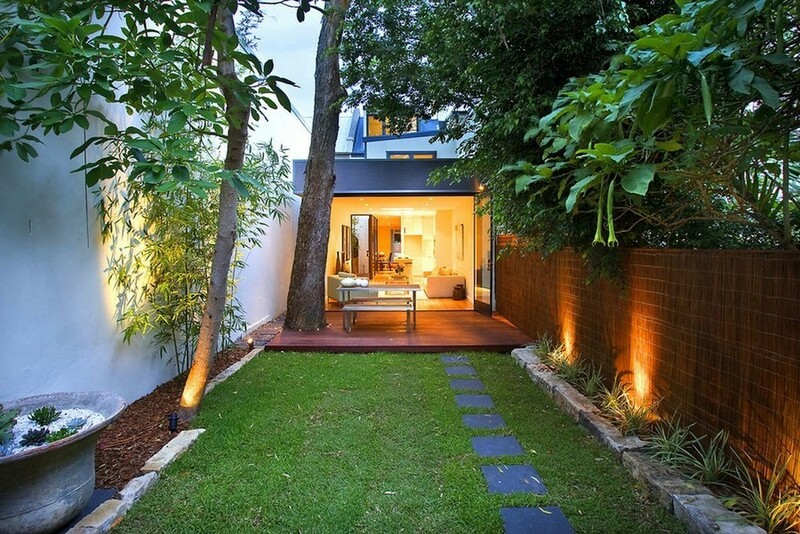 As for big shrubs and trees, here you will have more room for imagination. 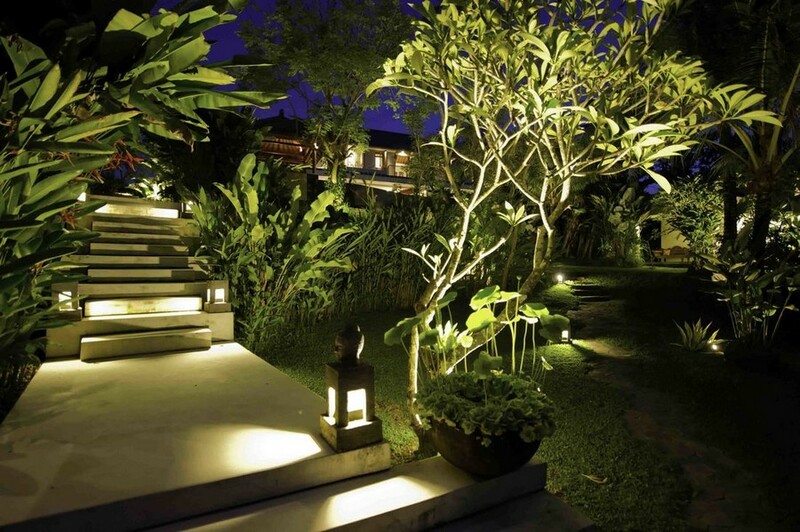 Try to discover interesting non-standard locations for light sources – don’t limit yourself to in-ground uplights only. 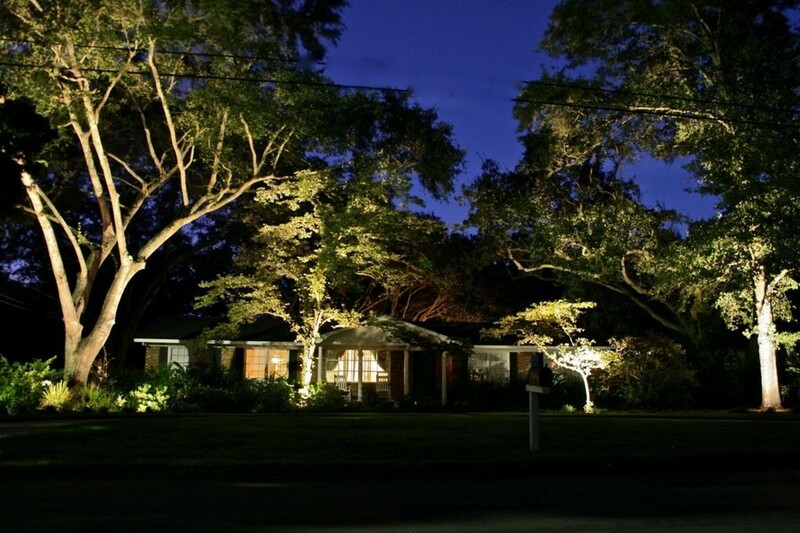 For instance a spotlight can be fixed right on the tree, so that the light showcased its most beautiful branches. 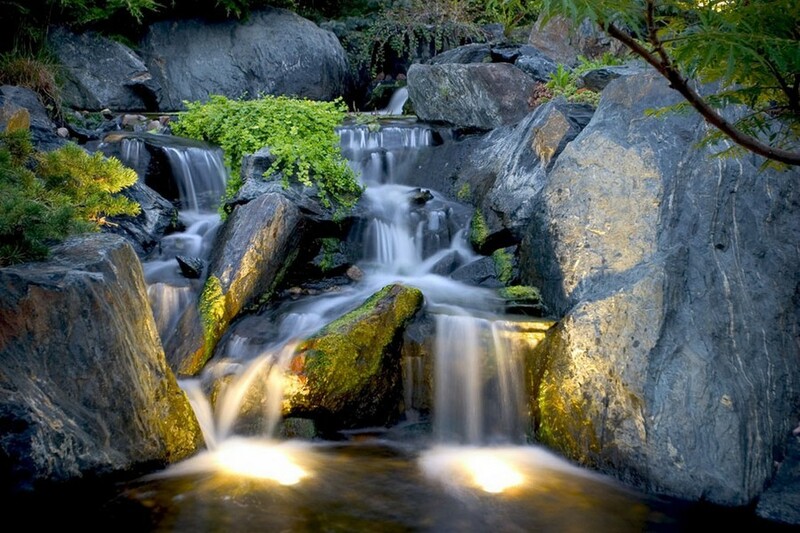 Experiment with angles and discover the most spectacular aspects of your landscape! 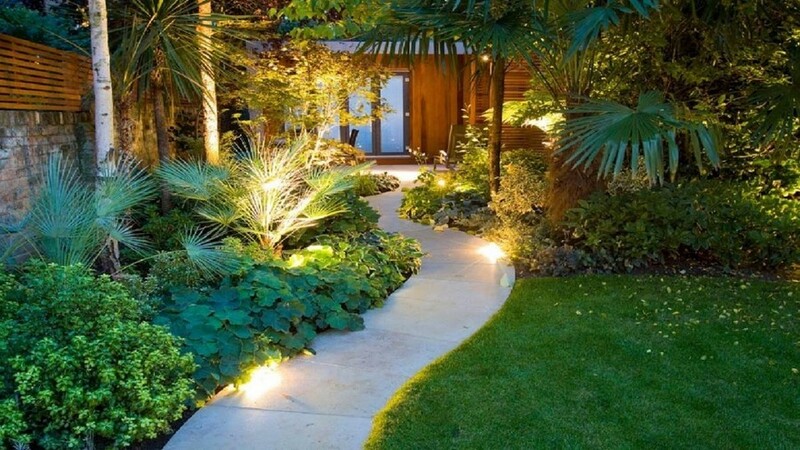 All the garden paths must be well-lit: that’s self-evident. 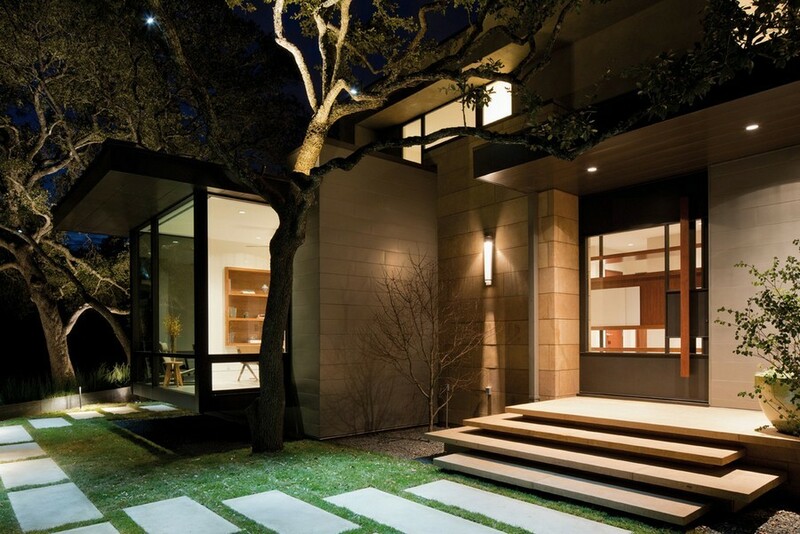 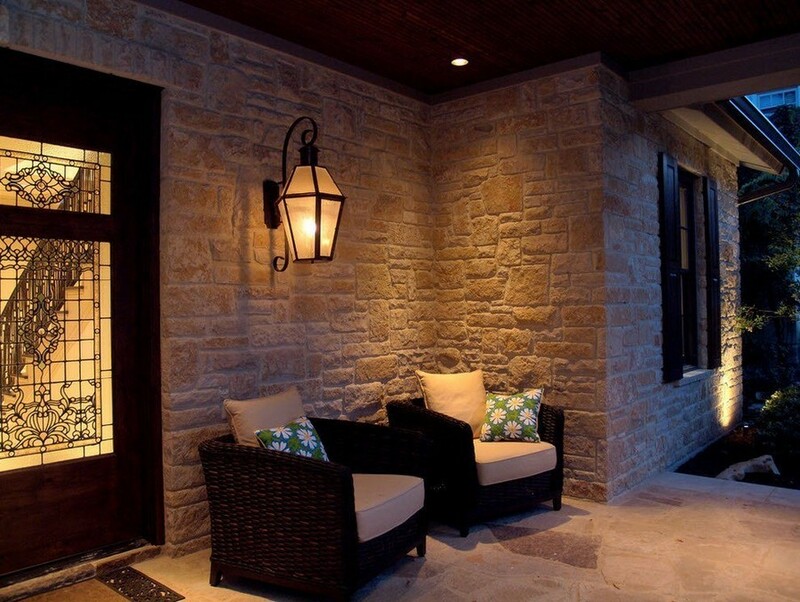 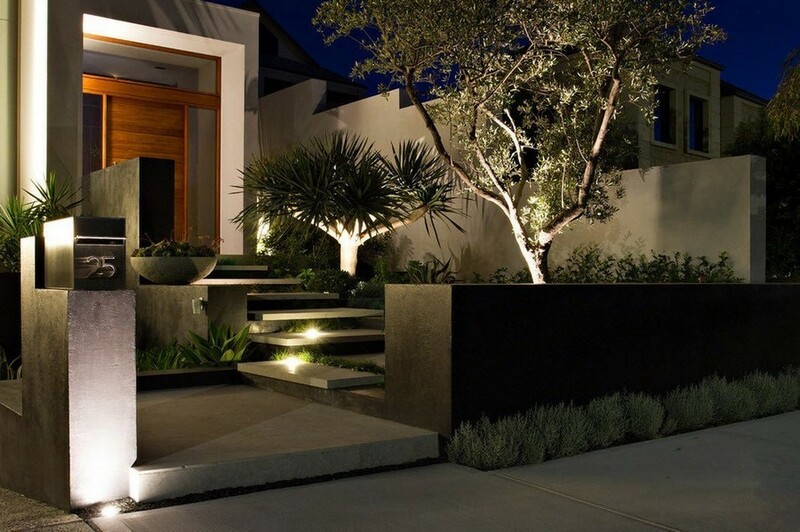 Full-fledged lamp posts are good for the main walkway leading to the entry door, but mini lamp posts or a few spot lights would look far cozier. 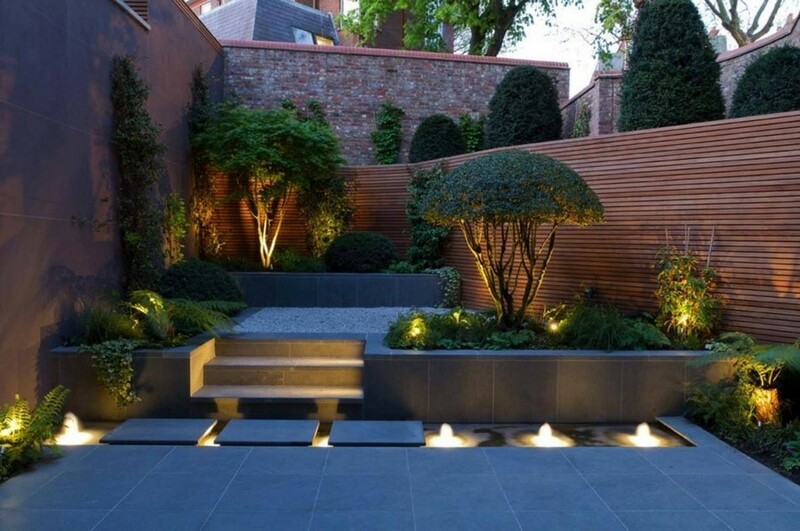 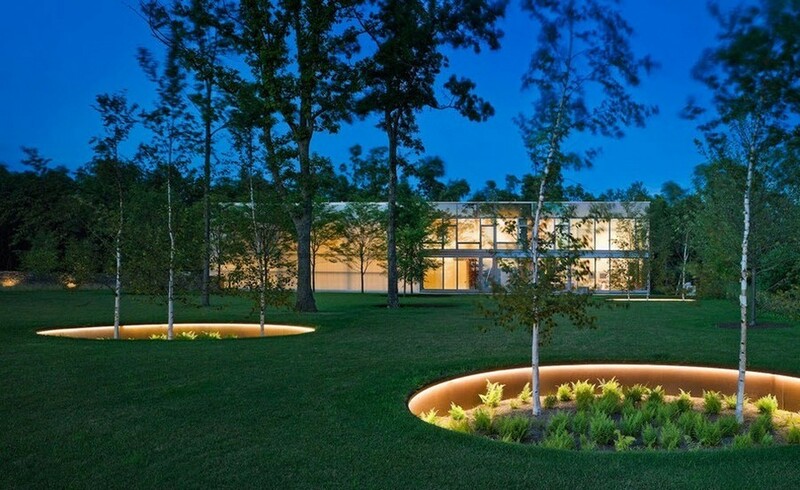 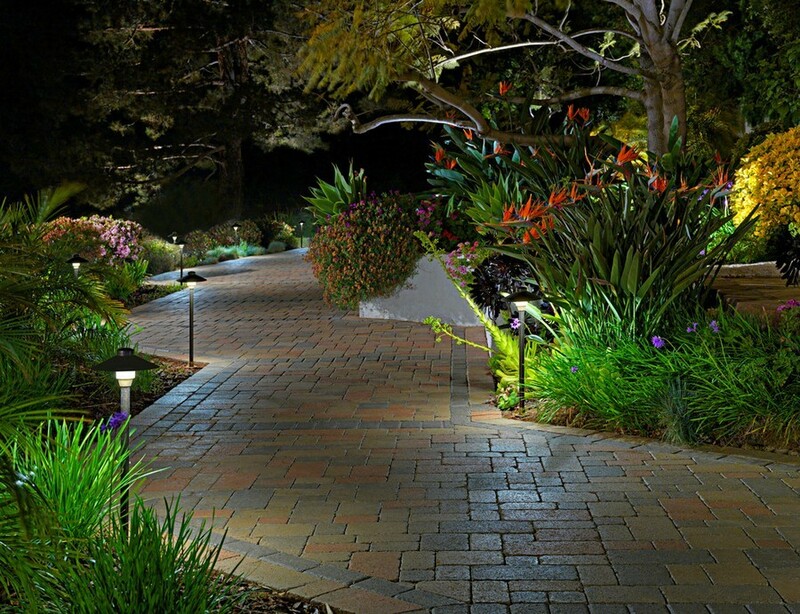 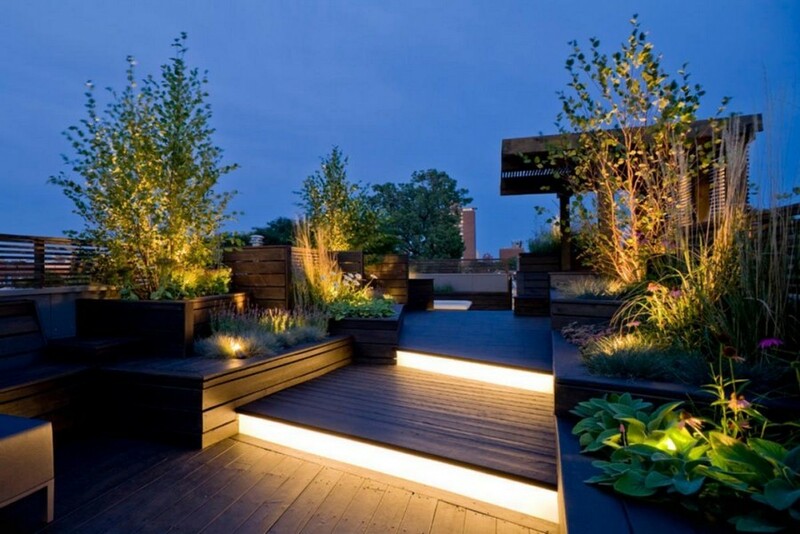 They give enough light to ensure safe strolls, spotlight plants growing along the pathways and decorate the garden. 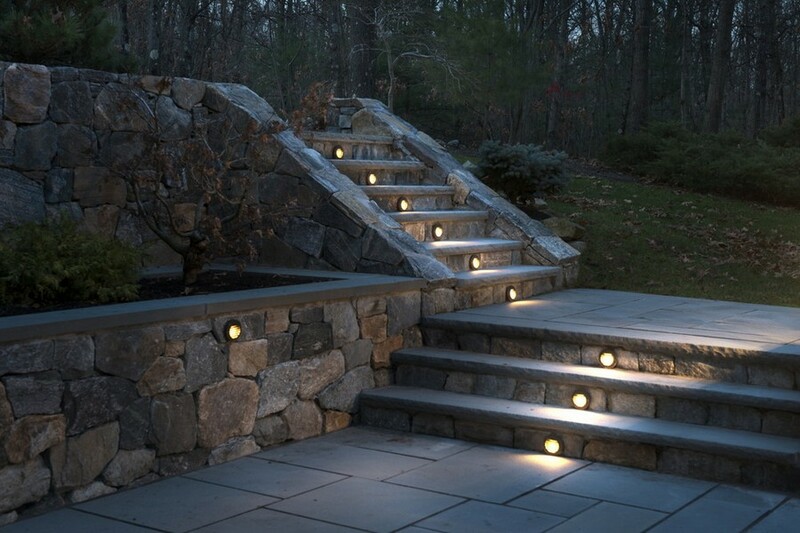 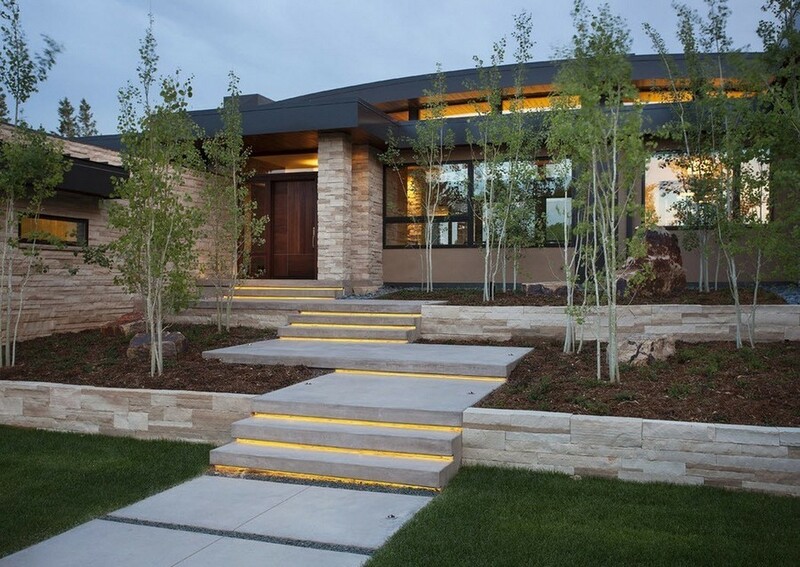 And mind the stairs – make sure that every riser is illuminated by either a spotlight or an LED strip light. 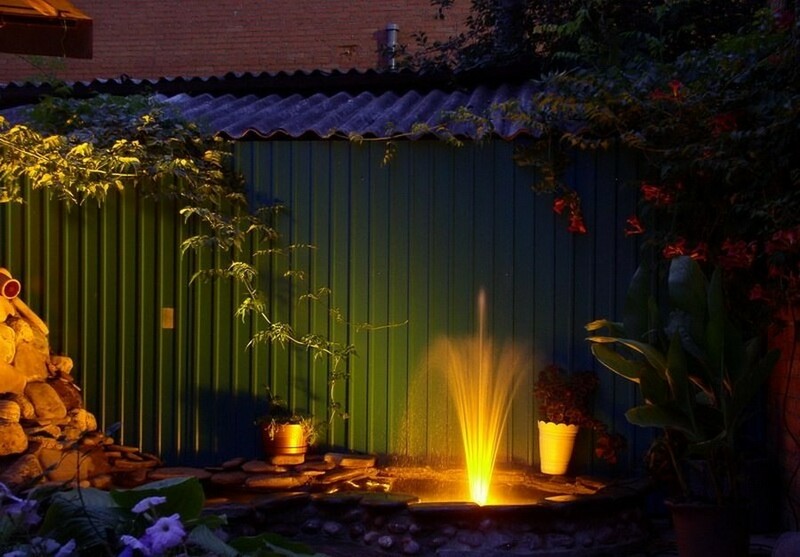 The sound of pouring water coming out of the dark is pretty weird. 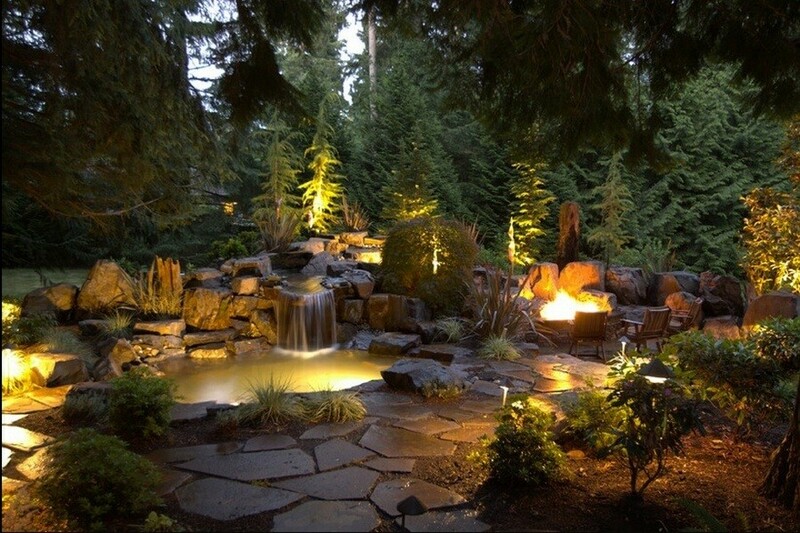 So if your landscape features a pond, a swimming pool, a waterfall or a fountain it would be nice to showcase them with underwater lights. 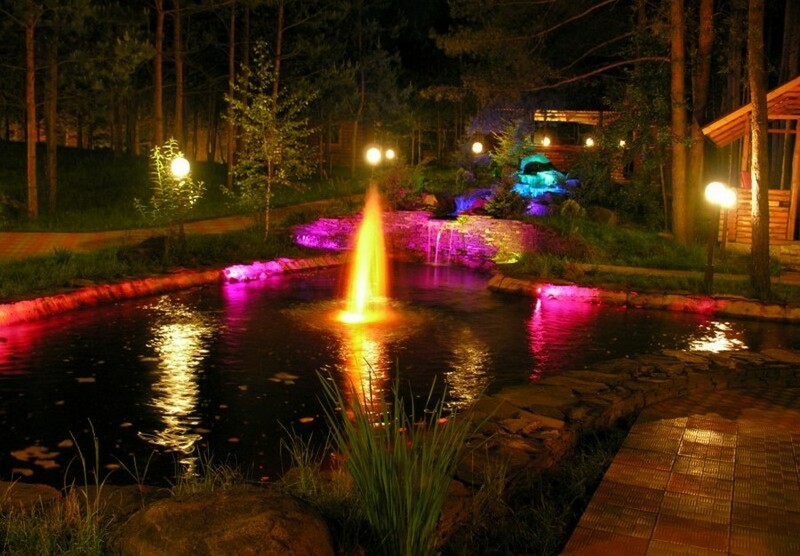 With the help of beautifully designed pond lights you can create an incredible play of light and magical shimmers in the water. 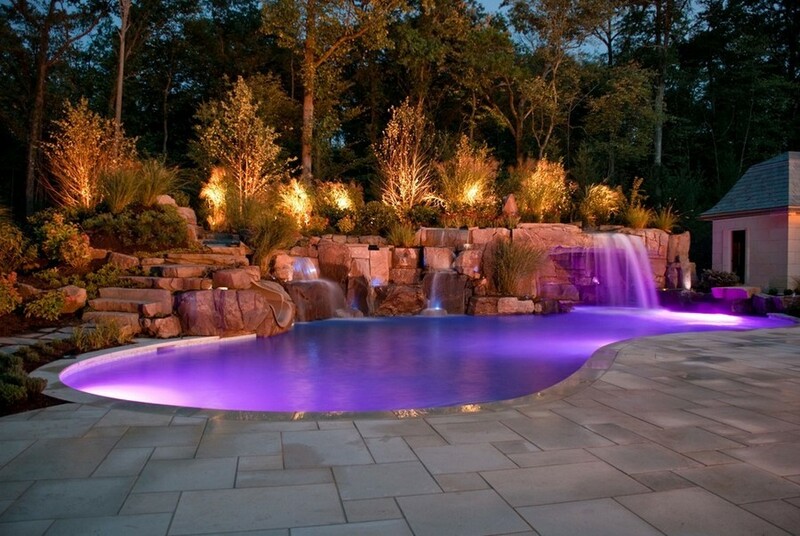 And it goes without saying that this will prevent you and your family from unwitting baths! 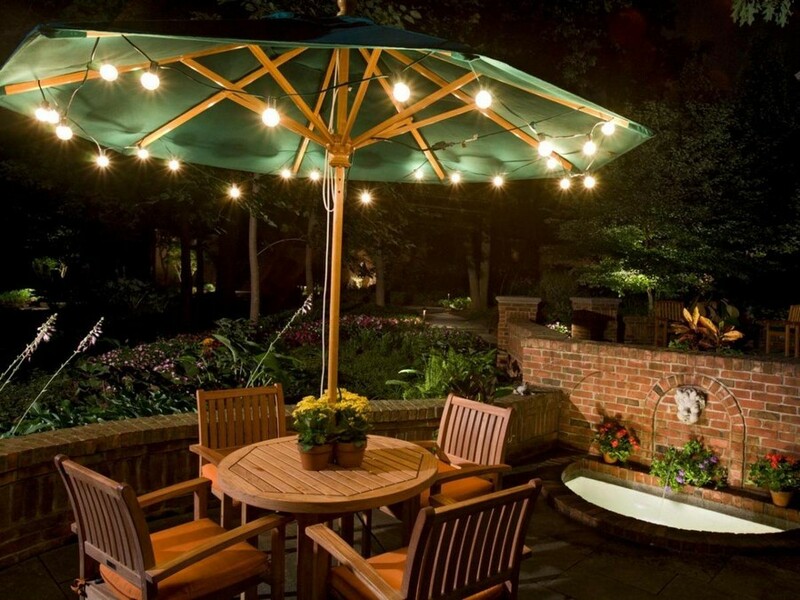 First and foremost they are intended for ornamental purposes, especially for creating beautiful ambient light in those areas where you spend most of your time. 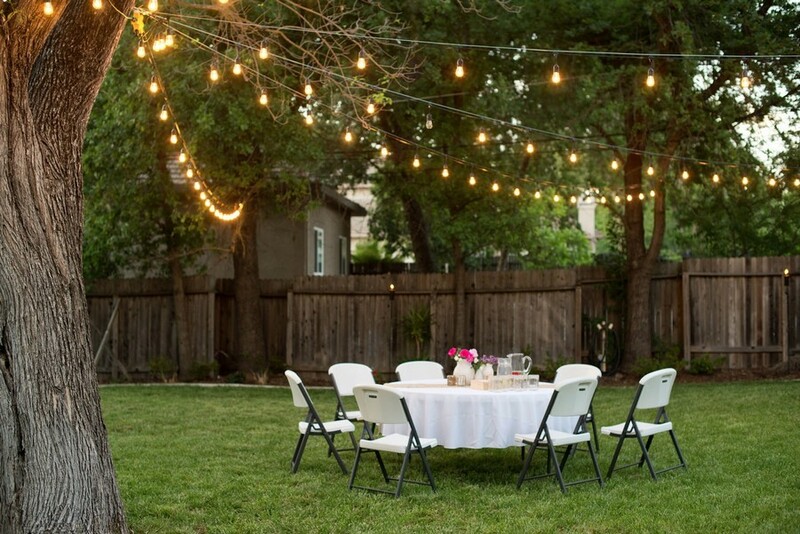 Hang string lights in a garden gazebo and family tea-time will turn into a true holiday. 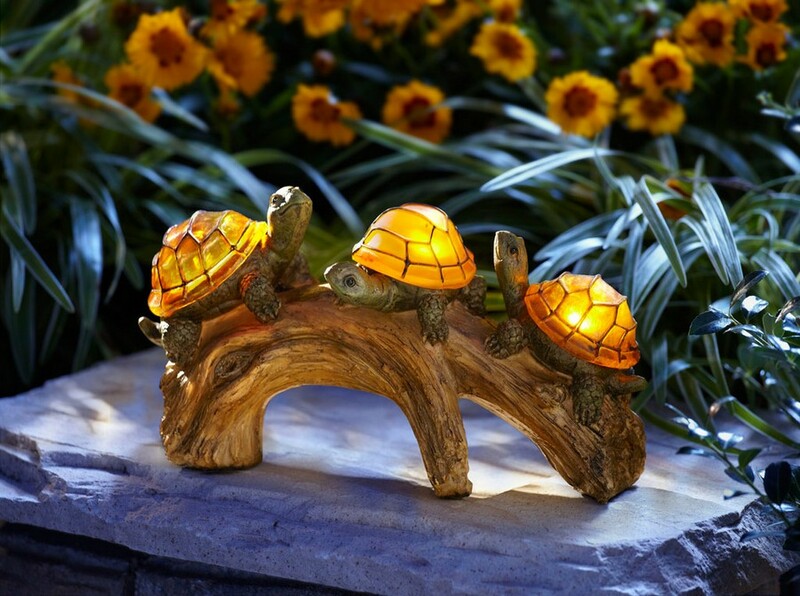 Hang it between lamp posts or trees and you will enjoy your way back home. 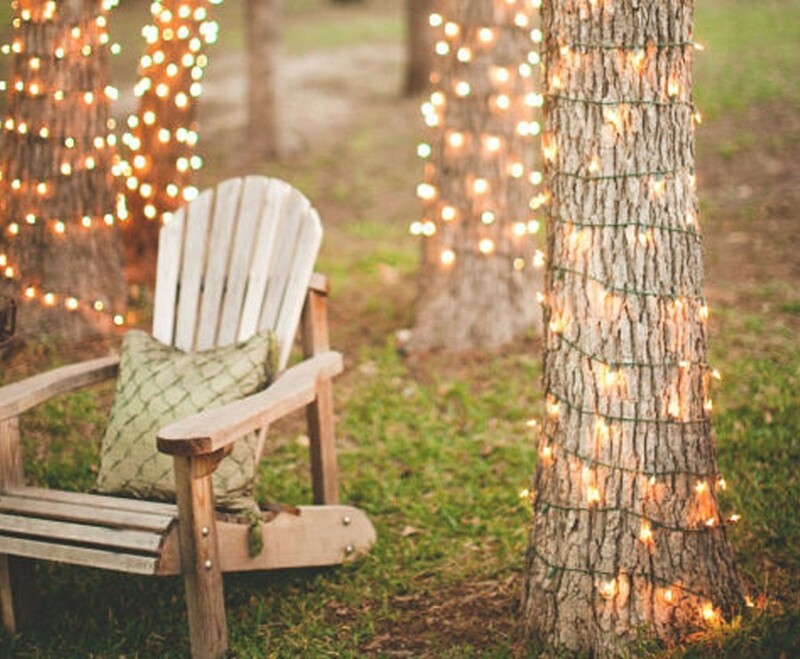 Wrap holiday lights around a tree trunk or a lamp post and you will get an original piece of décor. 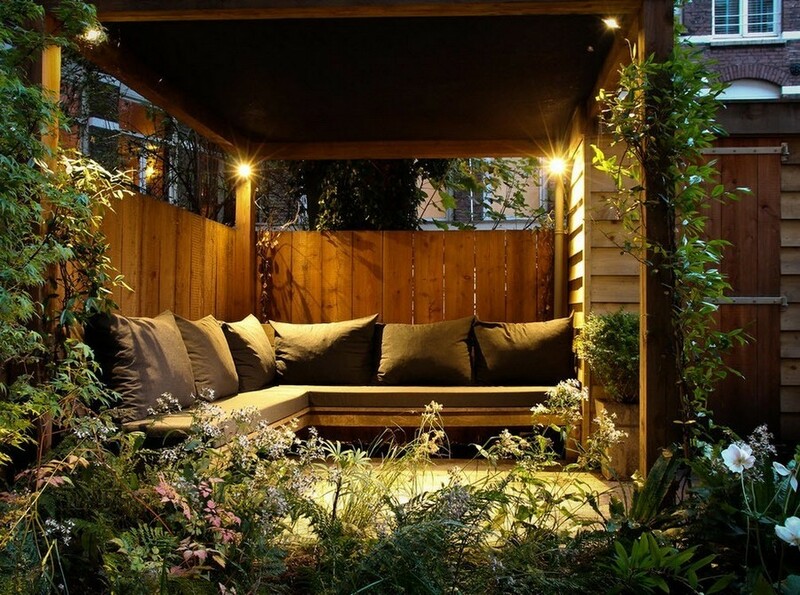 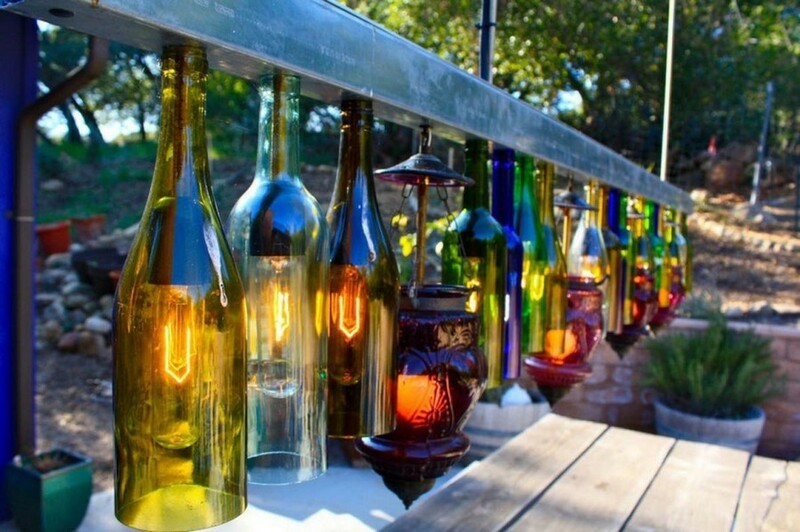 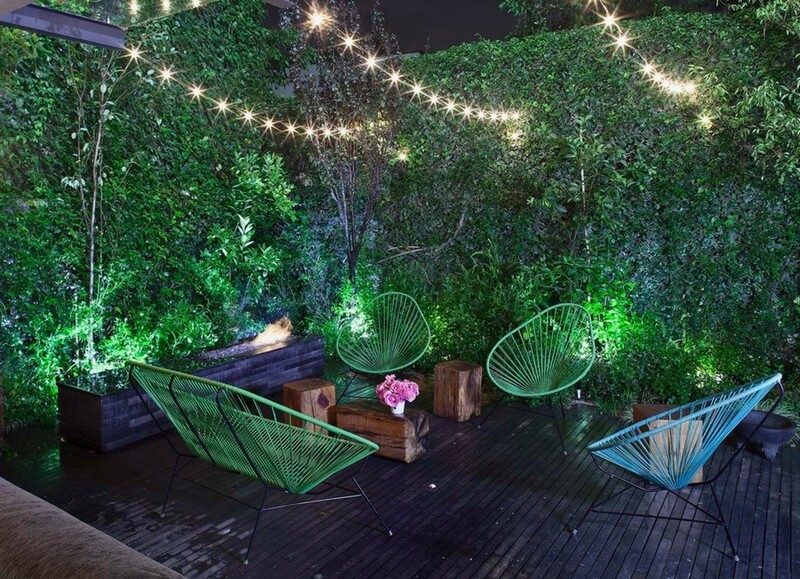 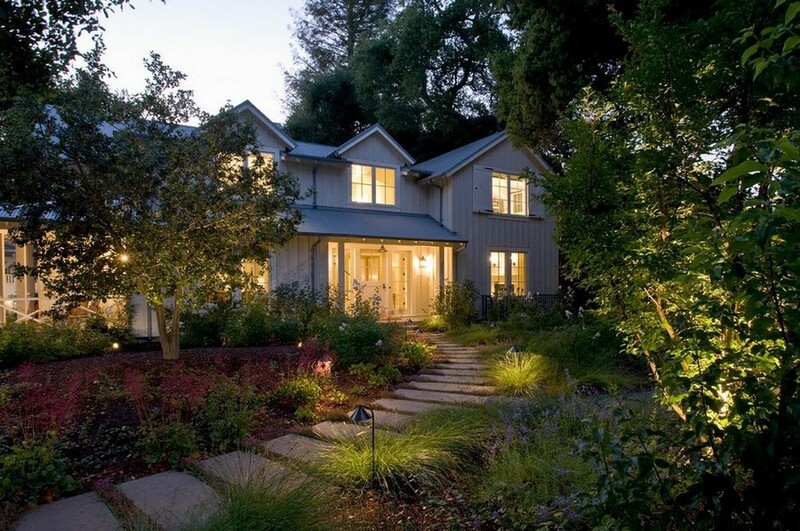 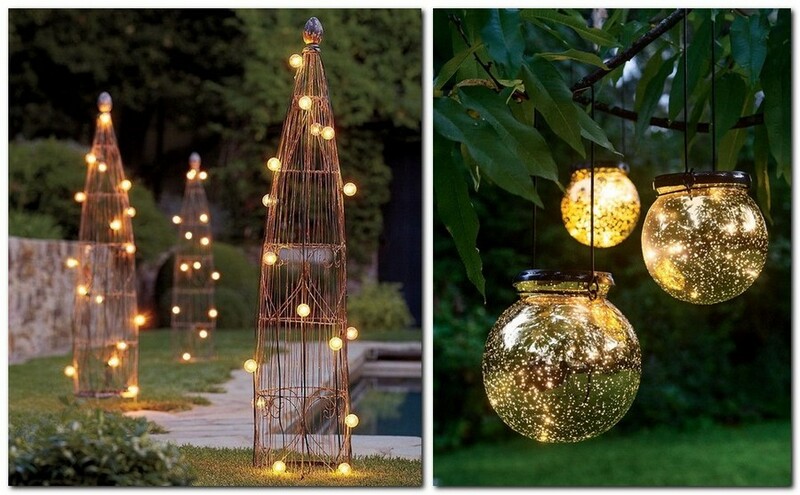 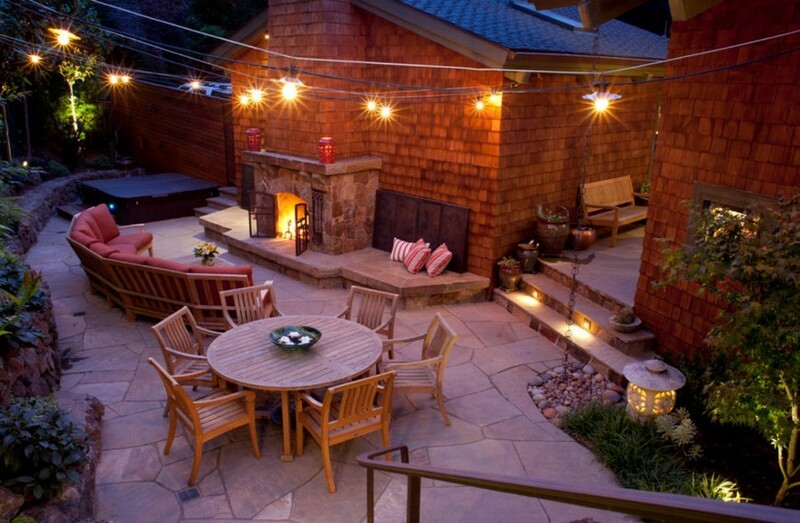 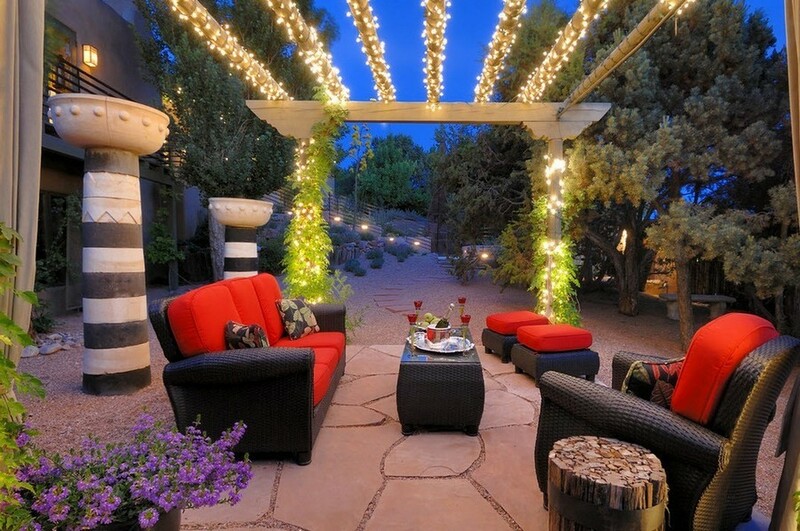 String lights give plenty of room for imagination and look spectacular wherever you put them! 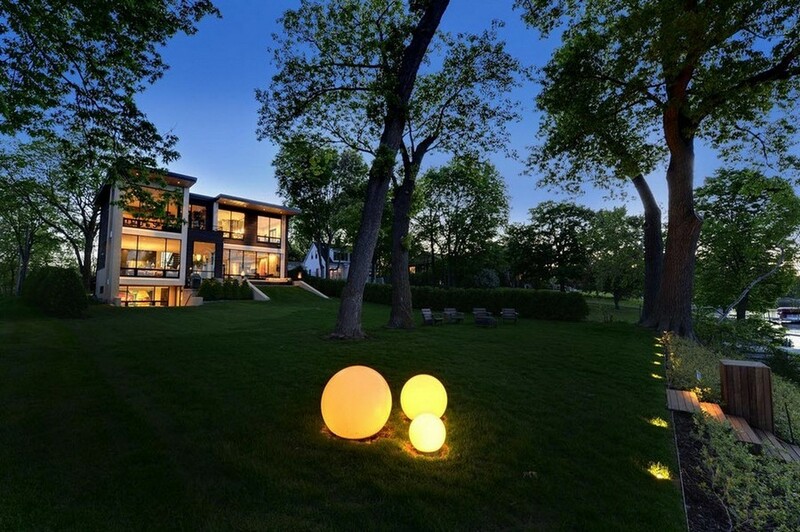 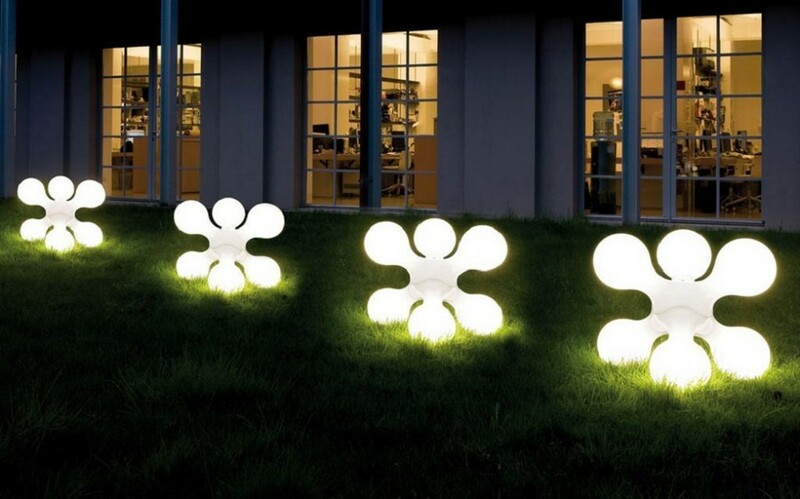 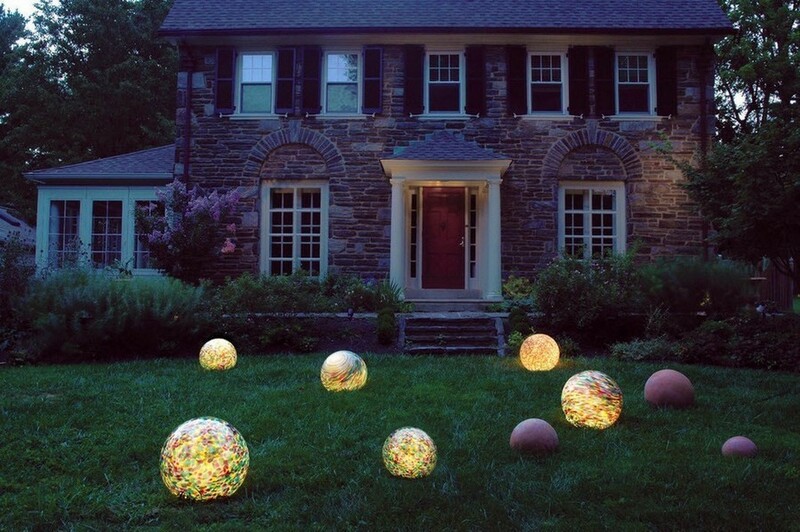 These can be full-fledged lighting installations in the form of animals, sculptures or simple geometrical shapes, like spheres, semi-spheres or cones. 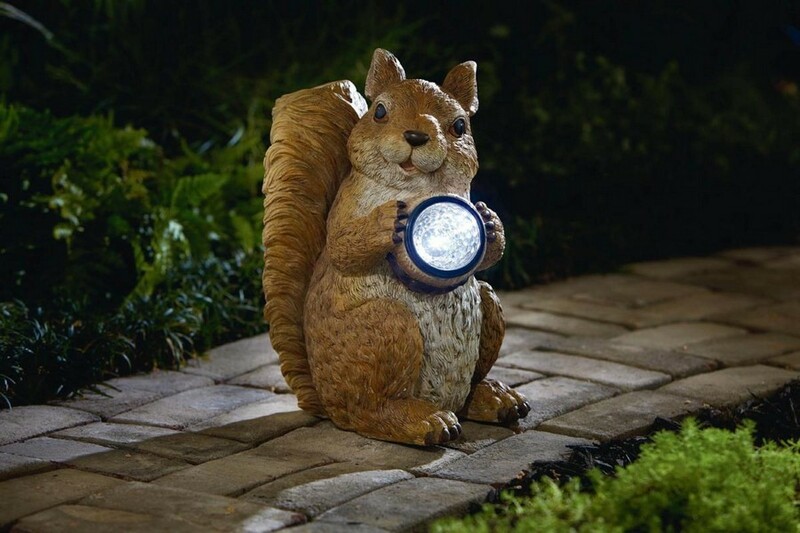 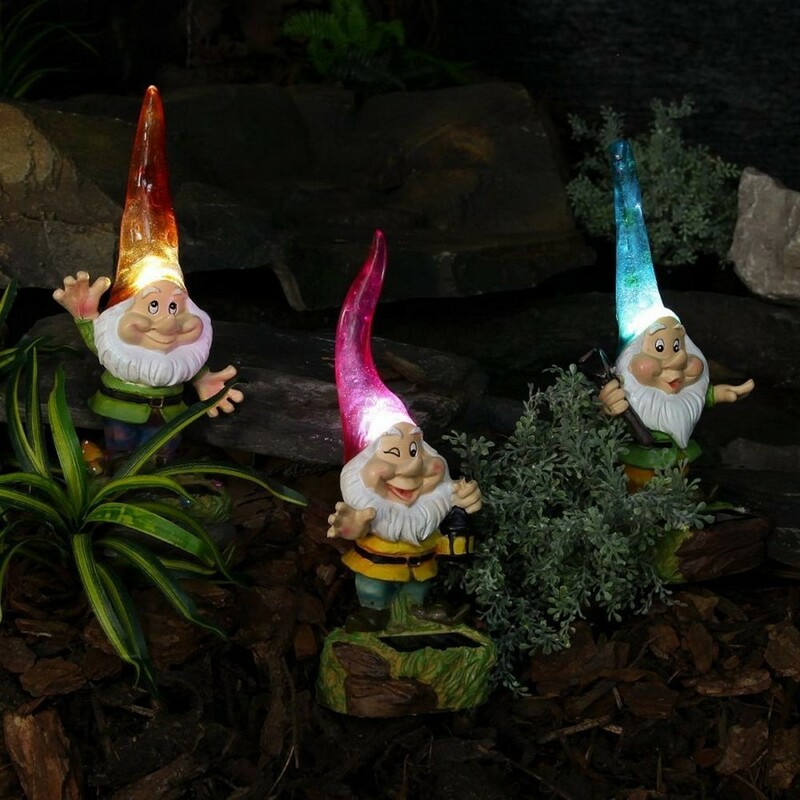 If you are a parent or just a big fan of fairy-tales then garden dwarfs, squirrels and bird lantern statues are what you need. 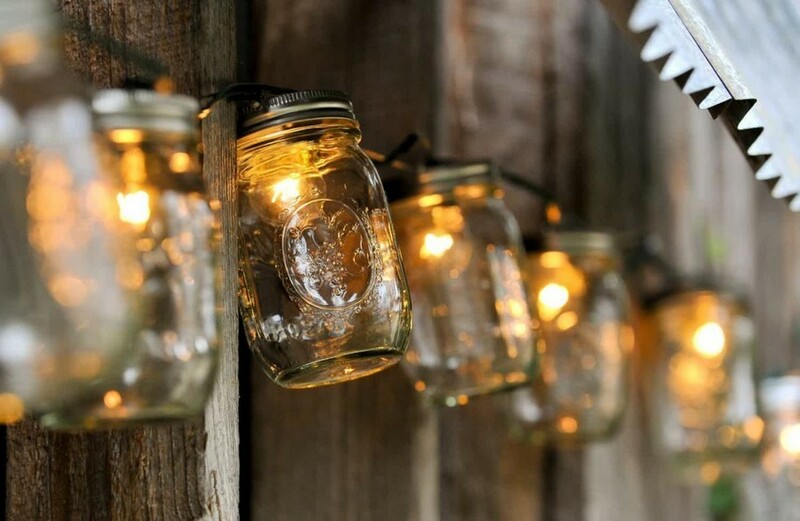 Or you can make an original garden lantern from a common mason jar and have it prominently displayed. 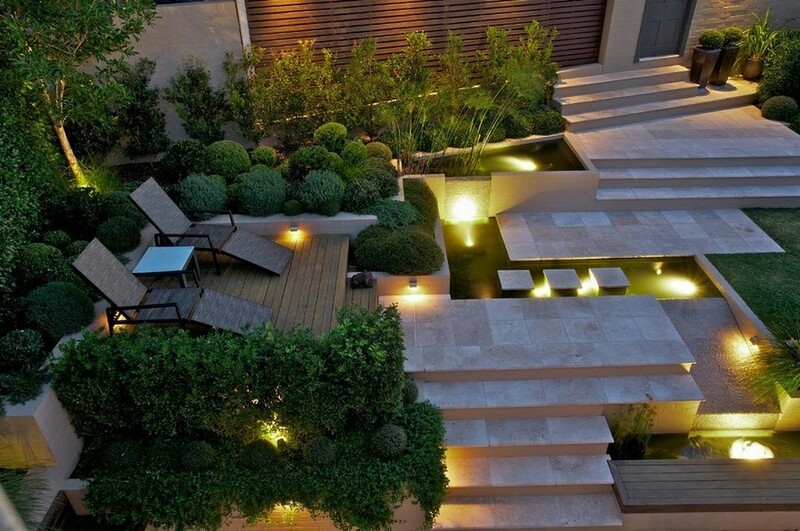 It all depends on your fantasy and the size of your yard. 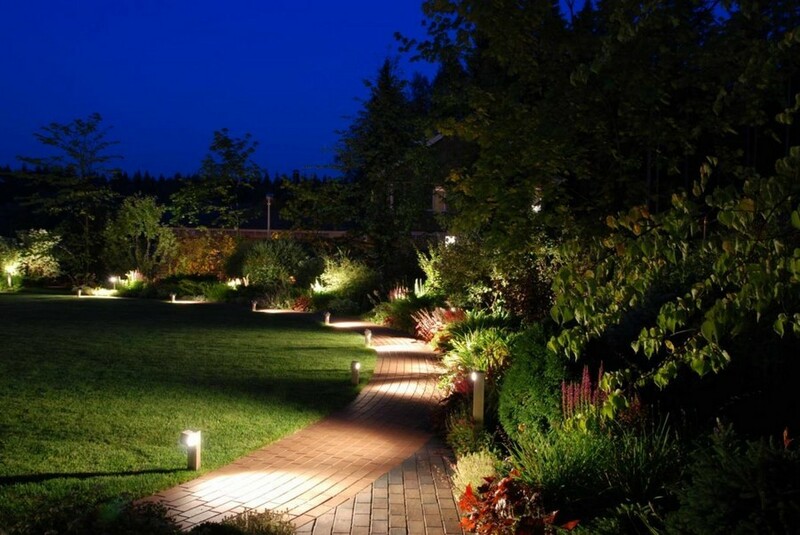 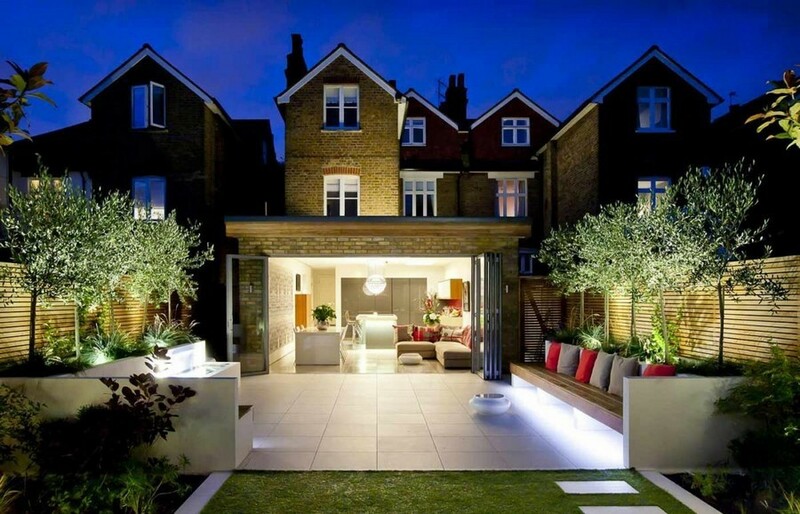 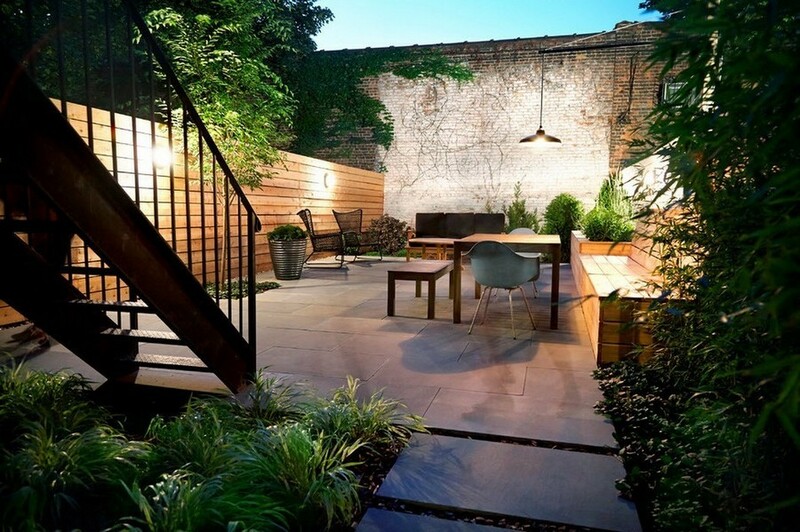 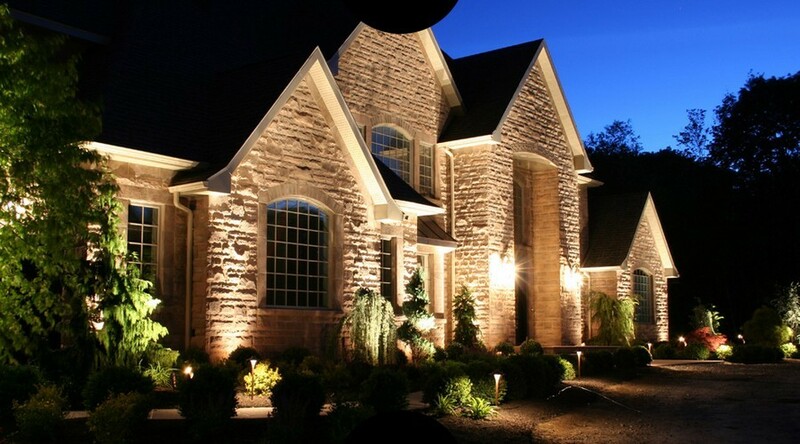 Once you are done with lighting and decorating your landscape, it’s high time to light the house and the rest of the buildings on your outdoor territory. 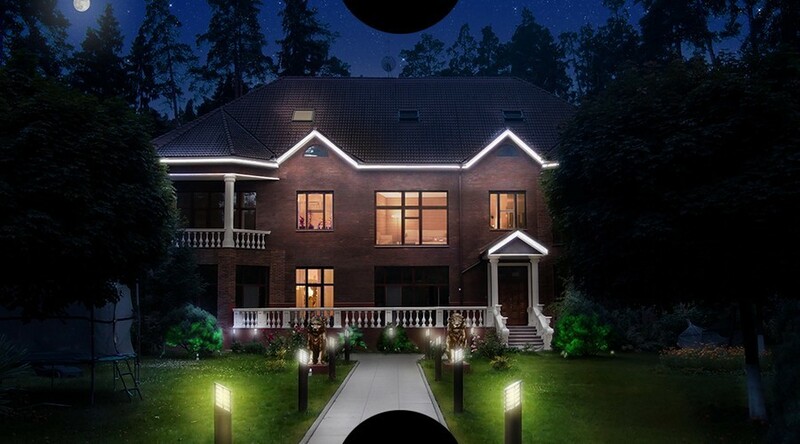 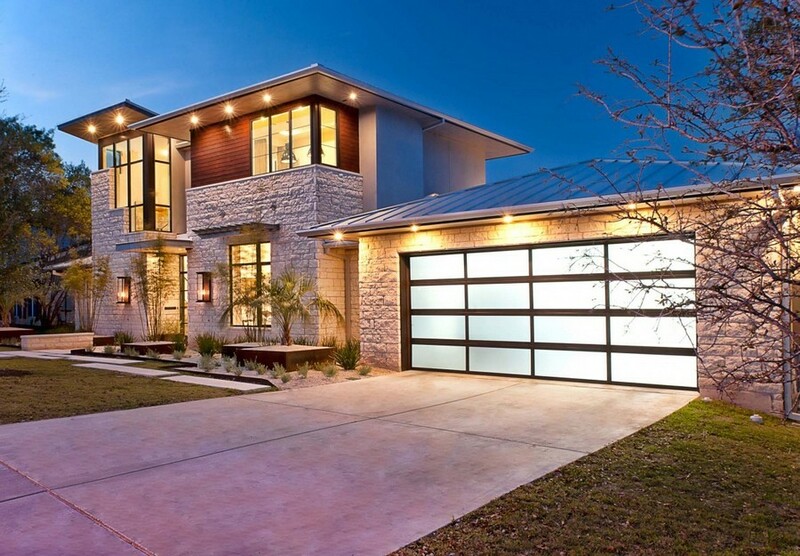 Here you’ve got plenty of options: wall-mounted, roof-mounted, cornice-mounted or in-ground lights directed to the front of the building – it’s a matter of taste. 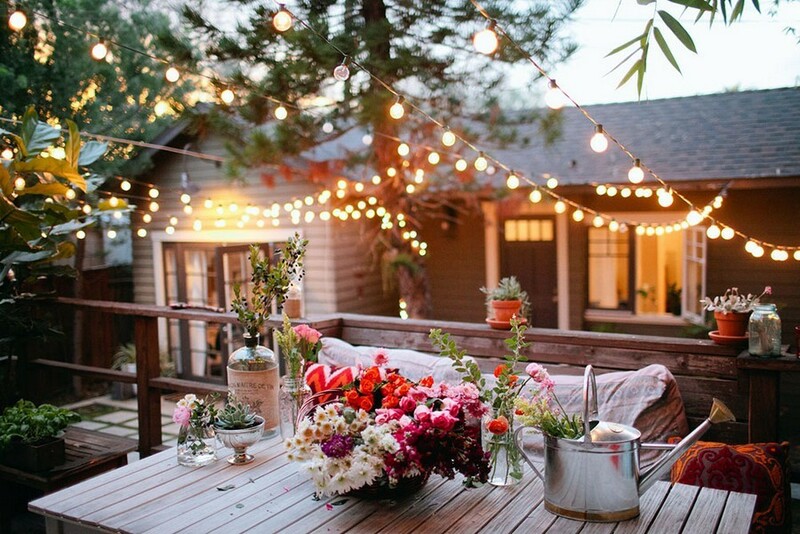 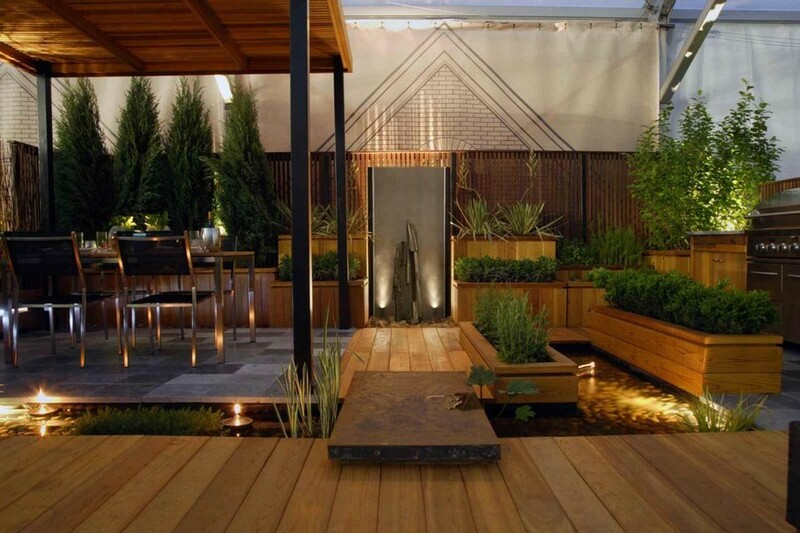 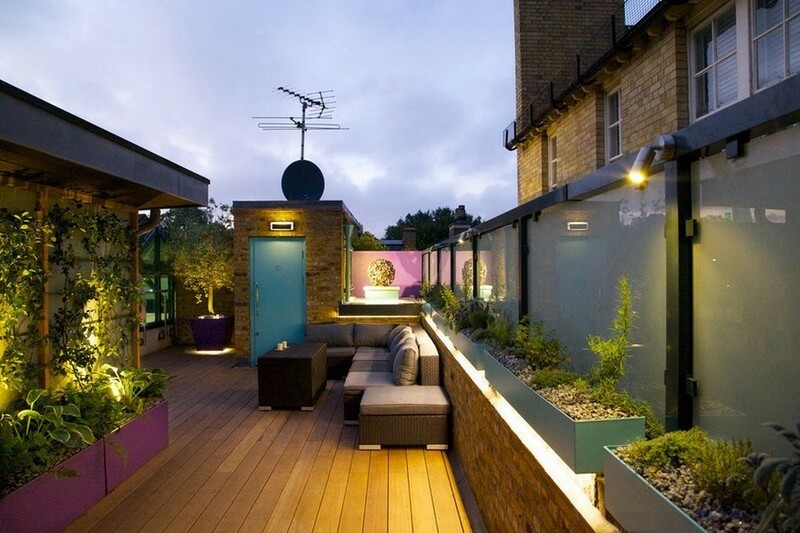 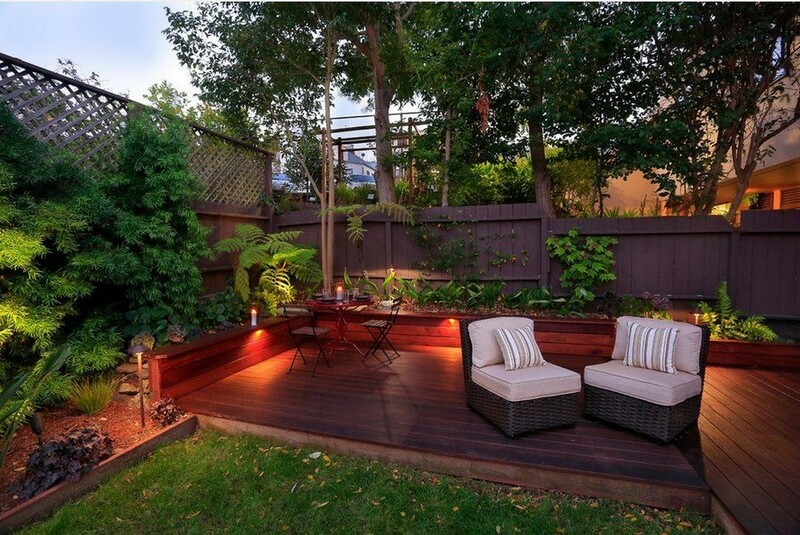 And don’t forget to light the porch, the deck and the garden gazebo – these are the zones where hospitality stems from!